There are black stones here and there in the stone walls. 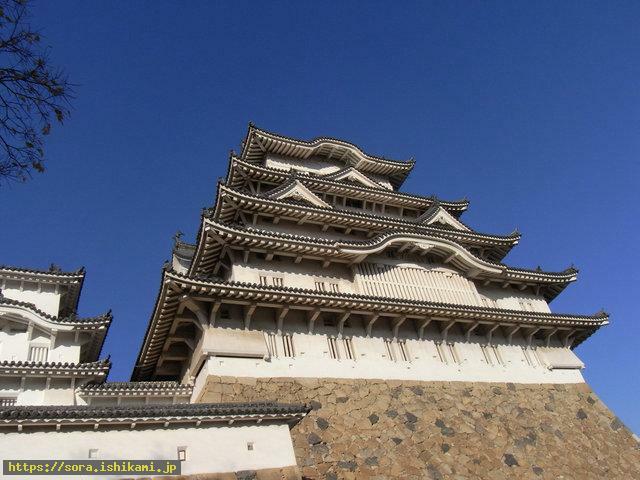 Those black stones inform Himeji castle in Hyogo Prefecture, Japan was made(=Atoms of Stone gods turned into the castle) by the Stone humans who imitated the castles in Europe. They kept in position in the war game. When they stayed still, their bodies got solidified. Therefore they played the war game for the purpose of exercise. Those Stone humans were a little evil ones who descended late and they made the castle in partnership with a little evil Sirius. The castle is the same type of the ones in Europe as there are holes through which stones were dropped, and the holes through which they point the muzzles of the guns, and narrow vertically long windows. There were no lavatories because Stone humans didn't excrete. The humans took advantage of the castle in later years but they seem to have used the pot of the juice for giants instead of lavatories though unthinkable. The big pot was drawn in the picture, though I can't find it actually.